I want to call attention to a landmark little book just released by the great Bible scholar Robert M. Price called Blaming Jesus for Jehovah. 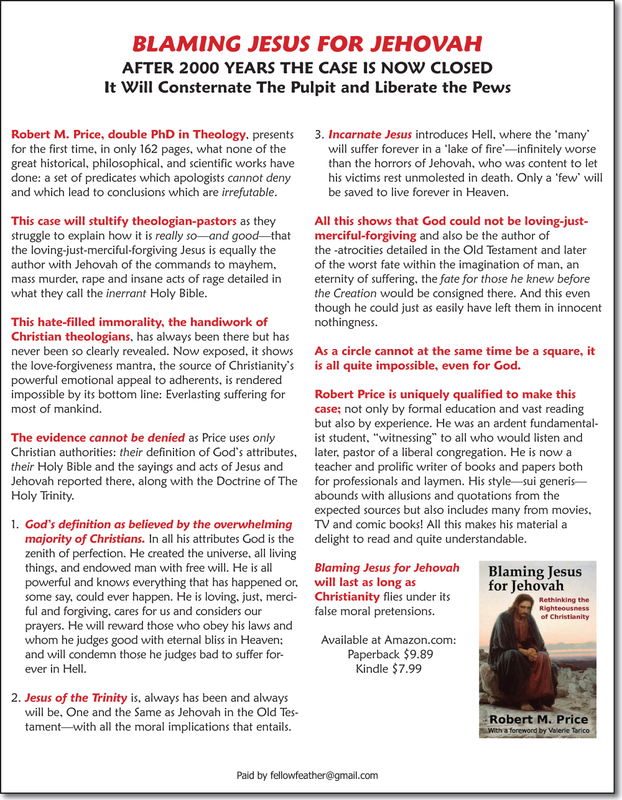 I have written and am running, at my expense, the ad below in The Chronicle of Higher Education issue of April 1, reaching 66,000 paid subscribers: college teachers and officials; and in HUMANIST magazine. Also in The Harvard Crimson, Chicago Maroon (U. of Chicago), Berkeley U. A version is being run in the Book Section of The New York Times. I am backing this because I believe every word in the ad is true and that it is the single most effective and emotionally-compelling case against the superstition that can be made — at least, to the vulnerables: the young, LGBT and others told by their religion that they are living in sin. How about a good miracle like this one in NC?